[By Nick, updated for 2013] Ah, the ice cream sandwich. Is there a more classic novelty? How do you improve upon a classic you ask? Add more ice cream of course! Well at least that's what the folks over at Blue Bunny believe. Now Blue Bunny is certainly not the first company to embrace such an idea. Fat Boy has been doing it for years and more recently Klondike jumped on the bandwagon with their thick vanilla and chocolate ice cream sandwiches. Now if you recall I picked on Klondike's sandwiches last year because I didn't see the purpose of releasing a so-so product in an already saturated market. I can't do the same to Blue Bunny though. See, they reformulated their already existing ice cream sandwiches instead of just randomly releasing a "new" product on the market. Now Wells sent me over two boxes of these upgraded sandwiches to review;simply vanilla and chocolate lovers. Seeing as I like to start "simple", let's start with the former first. Described as “Velvety vanilla ice cream layered between two classic chocolate wafers” these are the quintessential ice cream sandwiches we’ve all grown up on -- don't forget 100 years, 100 wishes is still going strong! Not only did Blue Bunny reformulate their sandwiches, but they've also changed the sandwich wrappers. While they still sport the adorable Blue Bunny logo, they've ditched the tight fighting paper wrapper and replaced it with a semi thick plastic wrapper which surrounds the sandwich instead. In my opinion, this is a great improvement as it lowers the chance of your sandwich getting stuck to the wrapper, plus they are easier to open. 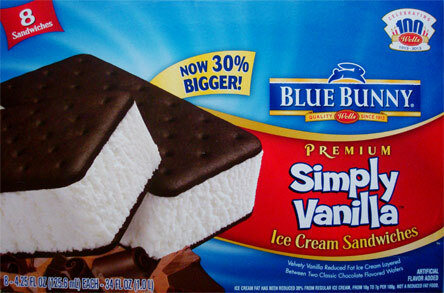 Thank you Blue Bunny for solving one of the major problems I have with ice cream sandwiches. None of my sandwiches seemed to have survived their trip too well, one even had the wafer in pieces, but let's ignore that and focus on what is clearly a nice ice cream to wafer ratio going on here. This one definitely looks a lot more enticing than a standard ice cream sandwich. So how do they taste? Exactly how you would imagine, to be honest. You have the classic chocolate wafers that add a bit of bitter cocoa flavor. Their only downfall is that they stick to your fingers every now and again. It’s one of my pet peeves when it comes to ice cream sandwiches but I can overlook it for size. The plentiful vanilla ice cream it is quality stuff, though nothing groundbreaking. I give the vanilla ice cream credit in that unlike most sandwiches where the filling tends to get overpowered by the wafers, they can hold their own. I’m guessing this is due to the ratio difference from your standard sandwich. The ratio of ice cream to wafer is perfect in my opinion, making these better than the ice cream sandwiches you had growing up. And, the bigger size makes them ideal for customization. You could add a healthy dose of peanut butter, some chocolate chips or whatever your heart desires. The possibilities are practically endless. Fair warning though, it could get very messy. Verdict? What you see is what you get. Okay, now on to the more enticing sandwich. The Chocolate Lovers sandwiches are described as “velvety chocolate ice cream with swirls of fudge sauce layered between two classic chocolate wafers.” The sandwich isn’t all that groundbreaking but it is at least different from your basic chocolate ice cream sandwich. This one also comes in the same wrapper as the vanilla sandwiches. While I already said I like the whole switch, I would’ve loved them if they were to label each one with what’s inside. I know I’m nitpicking but it can’t be all that hard to add that to the wrappers. Taking it out, it looks like a normal chocolate sandwich. Sure it’s a bit larger but there’s no sign of the fudge sauce yet. Let’s cut this in half and see if we can find some of that elusive sauce. Taste wise, these things are definitely a chocolate lover’s dream. First you get a hint of the subtle cocoa flavor from the wafers but that is completely overpowered by the chocolate ice cream. I don’t believe I’ve ever had Blue Bunny’s chocolate ice cream before but it’s exceptional. It’s more of a milk chocolate but it doesn’t overdue the sweetness. I haven’t had such a well-executed chocolate ice cream in a long time. 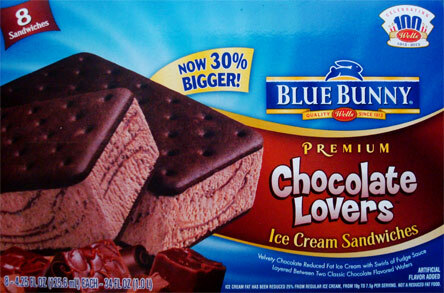 It’s no wonder thatn it was voted the #1 Chocolate ice cream in 2008. What takes these ones over the top are the chocolate fudge swirls. 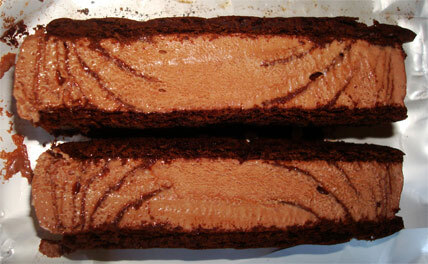 While not all that thick, they add a richness factor and compliment the chocolate ice cream exceptionally. The fudge sauce turns an above par ice cream sandwich into something that is very decedent. The only problem I have with these is that just like the vanilla sandwiches, the wafer tends to stick to your fingers. Other than that, this might be my new favorite ice cream sandwich. Verdict? So happy I have 7 more of these to enjoy…make that 6…umm, 5. Buy Again? Once I run out, which might be a lot sooner than I thought. Recap: All in all, I think this was a smart move by Blue Bunny. Instead of just making a new line of ice cream sandwiches, they took the initiative to successfully update a classic. Sure they’re not the most creative of flavors, nor are they the first to make larger sandwiches, but it’s a step in the right direction in my book. Keep up the good work, Blue Bunny! Just had a vanilla one and though they were disappointing. Had the original birthday ones and loved them. The vanilla ice cream in these just had like no flavor at all and the wafers had a good texture, but I've had brands with a better flavor. Oh my. I've made a mistake reading all about ice cream this On Second Scoop blog. But after reading about the Blue Bunny ice cream sandwiches, I really wanted to comment that while I can understand your dislike of the wafer sticking to your fingers, that has always been one of my favorite parts of the ice cream sandwich experience. It's not often you can say ice cream is "finger lickin' good." StephieG, I'm more of a fan of portability and when it comes to messy hands it's just not my thing. I do remember enjoying doing that as a kid though so I can definitely see the allure. I don't normally comment on food products but I have to say that I picked up a box of each flavor as they were on special at my local market and they are really good! The ice cream to wafer ratio is perfect and there is no way to just have one and stop! Is this a bad thing? ;-) Great job Blue Bunny! 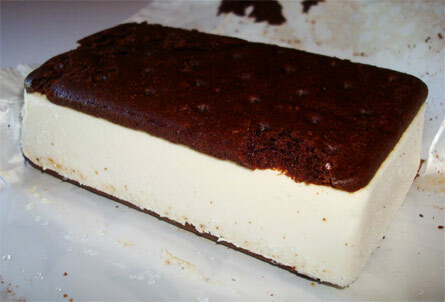 I luv ice cream sandwiches but they must hav changed the ice cream (too smooth now) and the sandwich part has no flavor. Hope they go back to the old version. The little bag it' in is nice. This was the first ice cream sandwich that I disliked. The wafers had an unappealing bitter chocolate flavor and the ice cream was lackluster, as I did not taste a hint of vanilla in the ice cream. I like vanilla ice cream to have a vanilla taste, whether it's real or artificial but all I could taste was just a sweet cream. After having high expectations from enjoying Blue Bunny's Birthday Cake ice cream sandwiches, I am really disappointed in these ones. 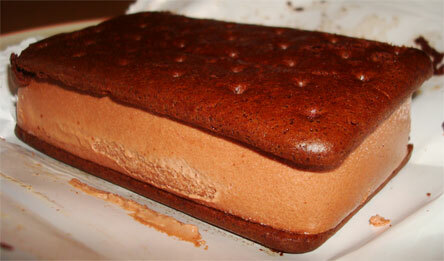 On a side note, I think companies should revamp ice cream sandwiches because they are a boring treat. Here is an idea: Replace the wafers with something more exciting, such as cookie dough, donuts, or some other baked good. These are the only ICS that I don't Like. Something about the wafer/cake part is so bitter and so sticky. To me they taste more like Carvel Flying Saucers than ICS. We bought the orginal container, and the ice cream did not seem as creamie as in the past.